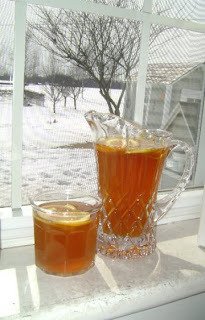 The bedraggled, grimy snow crust must be banished from the lands and so I make my Grandma's famous iced tea recipe. The taste of summer; iced tea and freshly squeezed oranges with a hint of mint. In season, I use crushed spearmint from the garden but now a few mint tea bags suffice. Boil water and brew up your tea. Sweeten with honey or sugar and add in citrus juices. Mix in a large pitcher with ice water. In summer, crush a handful of mint leaves and add in. Let stand at least 1-2 hours to meld flavors.